Talk about nostalgia! 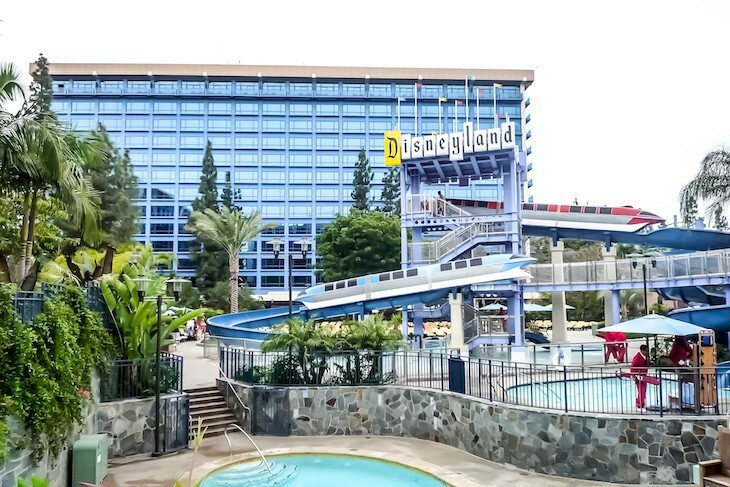 Disneyland® Hotel originally opened in 1955 with only 104 rooms. 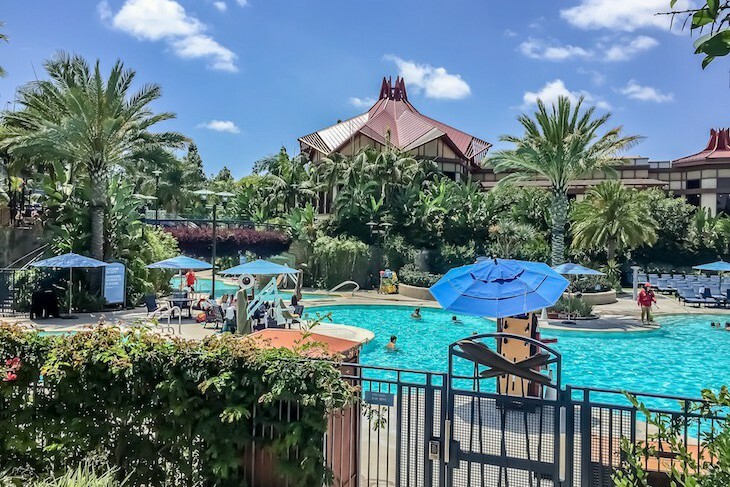 In its newest incarnation there are 975 rooms in three renamed themed towers—Adventure Tower, Frontier Tower, and Fantasy Tower—spread out over this fun, fun resort. 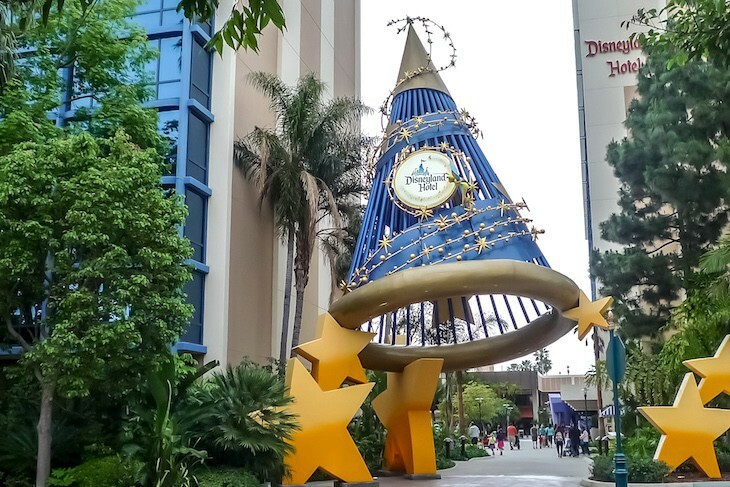 Each tower embraces a theme from the original “lands” of Disneyland® Park, each a time capsule of sorts filled with memorabilia and classic Disney artwork. 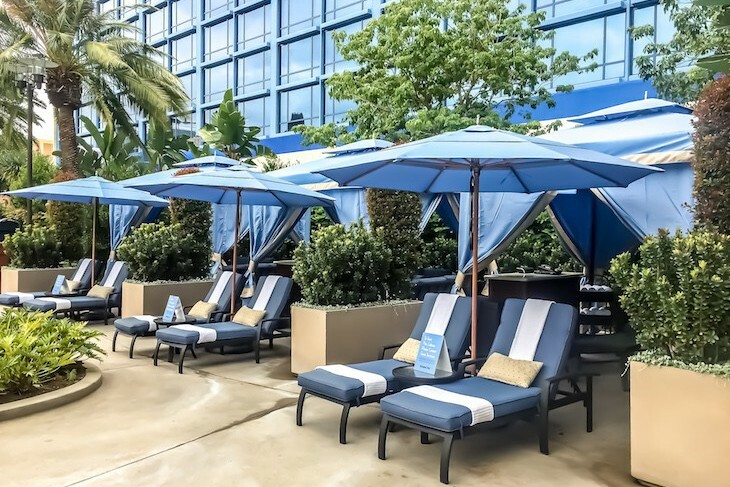 Contemporary guest rooms offering touches of magic, three pool areas, and several dining and entertainment options, making this remarkable hotel better than ever. You’ll find the lobby and front desk located in the Fantasy Tower, most of the concierge rooms and exciting Signature Suites in the Adventure Tower, and many of the standard suites in the Frontier Tower (the only tower offering balconies in some of its rooms and suites). 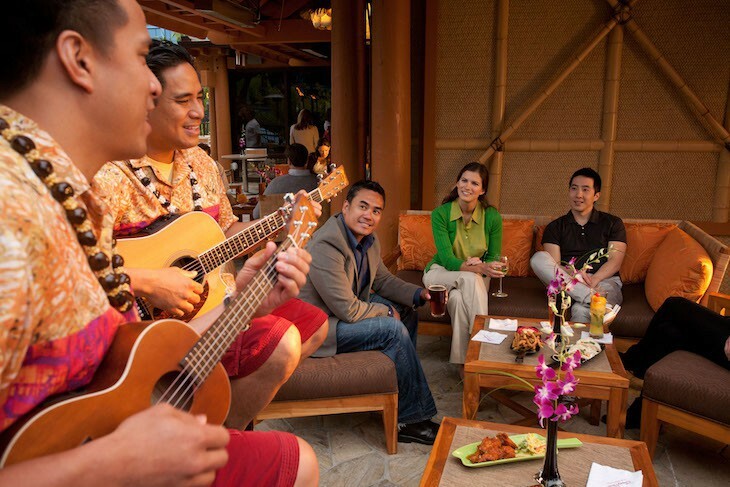 Outside are three sparkling pools (not to mention fabulous So Cal weather), a welcoming fireplace area with comfortable and cozy seating, and Trader Sam’s terrace, a favorite gathering spot with live Hawaiian music nightly. Check out the tea cup seating! Not your normal cookie-cutter size, these rooms offer anywhere from 364 to 415 square feet depending on the configuration with every room a bit unique throughout the hotel. Headboards are the highlight with a carved Sleeping Beauty Castle motif and fiber optic fireworks; flip the switch and it lights up and plays When You Wish Upon a Star. Fireworks motif bed runners in a navy blue and gold color scheme along with “A Dream Is a Wish Your Heart Makes” velvet bolster pillows decorate fluffy white duvets on either two queen beds or one king. The same blue/gold color scheme continues into the drapery and carpeting. Walls are covered in subtlety-striped wallpaper, and additional furnishings include a beige corner easy chair, small desk and chair, entertainment center containing a flat-screen TV, and a vintage framed photograph of Disneyland in the ’50s. Our particular guest room came with a split configuration bath on either side of the entry hall with a tub and commode on one side, and a small closet and single sink in a black granite vanity on the other (remember that there are many bath layout variations). Mickey-gloved light fixtures and sleek Mickey-eared sink and shower hardware are fun surprises in all the rooms. Additional amenities include an undercounter refrigerator, super comfortable mattresses and pillows, and high quality linens along with robes, H2O spa bath products, full length and makeup mirrors, hairdryer, iron and ironing board, and electronic safe. Guest rooms here can accommodate up to five people with a daybed. Views vary and your options are: Standard View of either the front or the back of the resort and a parking area; Resort/Pool View of the central pool courtyard or Downtown Disney; or the Upper Level Resort/Pool View also looking at the central pool courtyard or Downtown Disney but on a higher floor. If you want a balcony request one in the Frontier Tower on the 14th (top) floor and/or the sides of the building in the corner rooms. 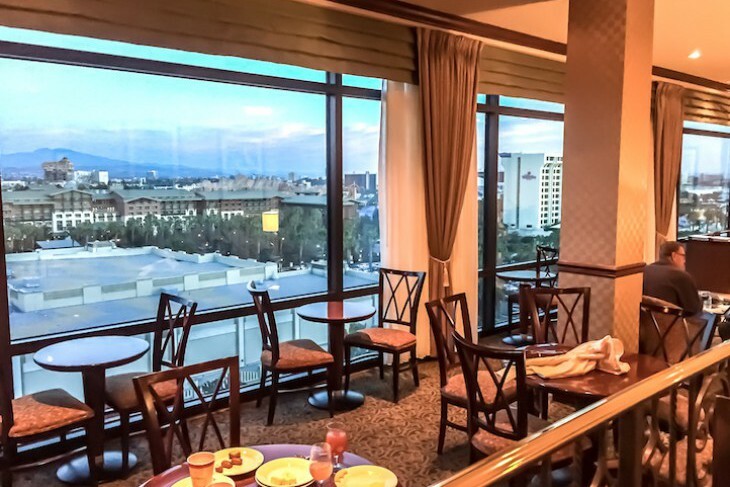 Our 14th floor room was considered a Standard View overlooking the parking lot but also offered an incredible view of Disney's Grand Californian Hotel® & Spa, Disney California Adventure® Park and Cars Land, and the surrounding area. 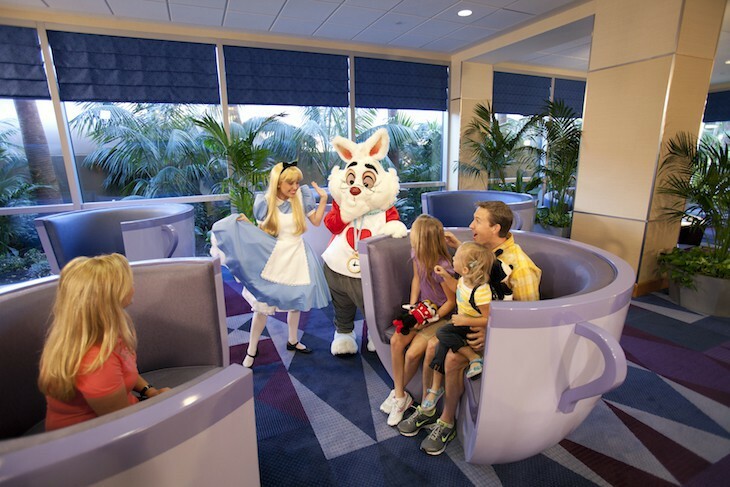 Guests with concierge level service have access to the E-Ticket Club located on the 11th floor of the Adventure Tower. From this lovely vantage point are spectacular vistas of the entire Disneyland Resort, including a view of all five “mountains” in both parks. And better yet, it’s a picture perfect location for watching the fireworks show complete with music. Additional amenities include nightly turndown service and priority check-in and checkout processed regrettably at the front desk instead of inside the concierge lounge. 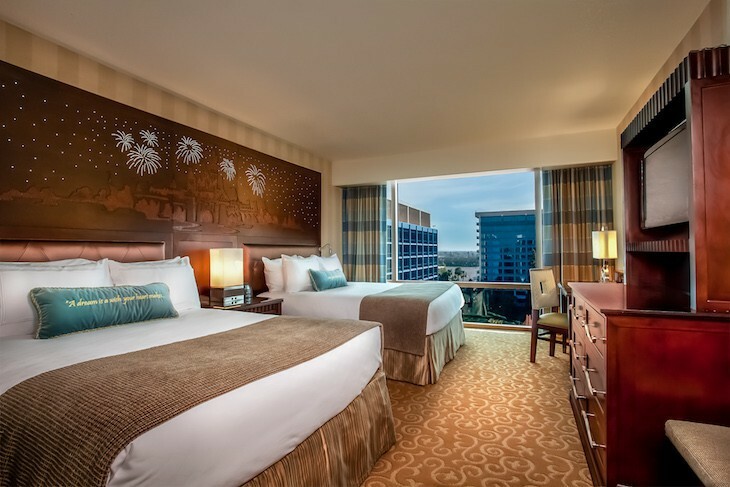 Concierge guest rooms have either: a Standard View on a lower floor of Adventure Tower; or a Premium View on a higher floor either overlooking Downtown Disney and the parks in the distance or on the opposite side of Adventure Tower overlooking the resort’s pool. Breakfast offers fresh fruit, juice, cereal, bagels, mini muffins, pastries, oatmeal, deli meats and cheeses, hard-boiled eggs, and yogurt. Snacks throughout the day include a variety of beverages, fruit, homemade potato chips with salsas, crudites, pretzels, granola bars, banana chips, Smucker’s Uncrustables, and cookies (sugar, oatmeal, and raisin chocolate chip). 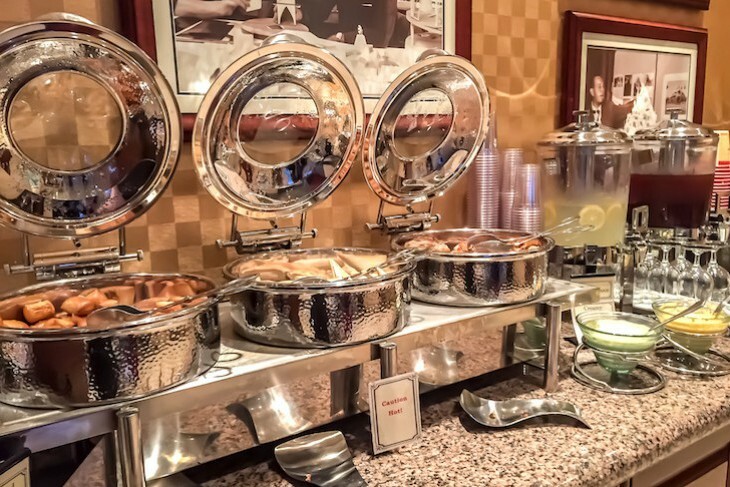 Evenings bring cold appetizers of cheese, breads, fruit, and crudités as well as two hot entrées such as chicken quesadillas, cheese and pretzel bites, mushrooms with ratatouille, mini pizza, beef teriyaki skewers, calzones, macaroni and cheese balls, coconut chicken strips, and the like. Beer and wine are served by the lounge hosts with the choices of BV Chardonnay, BV Cabernet, BV Merlot, and Woodbridge White Zinfandel. Bottled water is available for the asking, and there is also a Nespresso machine. After dinner enjoy cordials along with Magic Bars, cookies, brownies, rice crispy treats, and mini tarts. The most exciting suites at the Disneyland® Resort are the fantastically themed Signature Suites, all found on the Adventure Tower’s 11th floor. By contrast the standard suites here, some of which come with balconies, are located in each of the three towers with some offering far superior layouts than others; you never quite know what you will receive until check-in. Only the Signature Suites automatically have concierge access. Concierge in standard suites is by request only with confirmation on arrival and for an additional fee. Don’t jump when the doorbell rings in the Adventureland Suite—it’s only the sound of drums in deepest, darkest Africa! 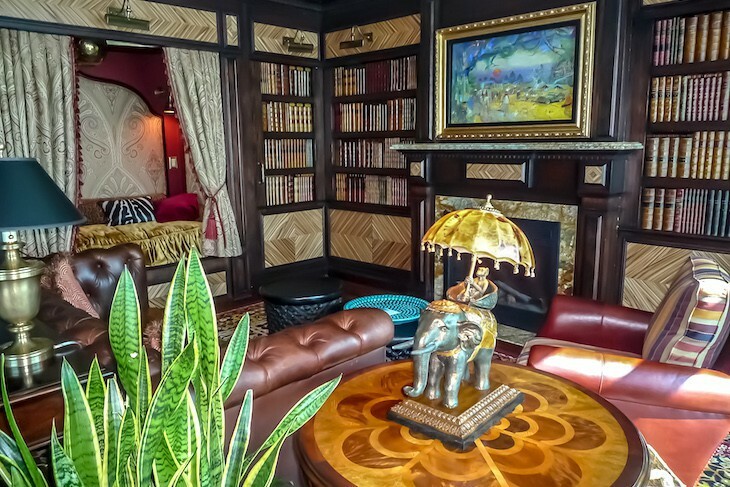 Its décor includes a mix of tribal masks lining the walls leading to a living room with Oriental rugs upon rich wood flooring, a leather-tufted sleeper sofa, monkey and elephant-themed curios, drum-style cocktail tables, a cozy draped sleeping alcove, a TV hidden behind a painting hung above a gas fireplace, even a hidden closet behind the faux bookcase, all evoking the idea of a British Colonial safari. 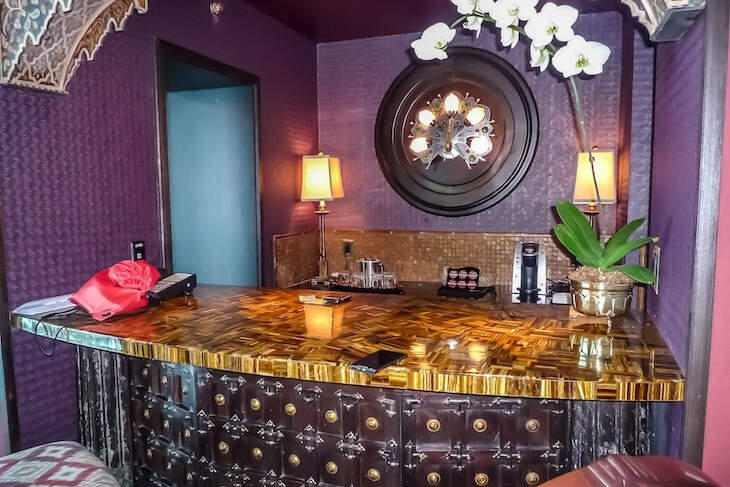 In the adjoining dining area a six-person table sits on a zebra rug next to a striking wet bar boasting a gorgeous tiger’s eye countertop. Nearby is a bonus full bath with a copper pot sink and a nice-sized shower. In the master bedroom a delightful safari theme reigns with walls decorated in expedition helmets and explorer maps, a four-poster king bed draped in mosquito netting, slate floor covered with Oriental rugs, crocodile-stamped leather easy chairs, luggage-style end tables, even a claw-foot tub in the sleeping area. And you won’t even believe the master bath with its dual sinks in a marble vanity, a TV built into the mirror, and, best of all, a rock-lined steam/rain shower/whirlpool tub complete with rain forest sound effects. 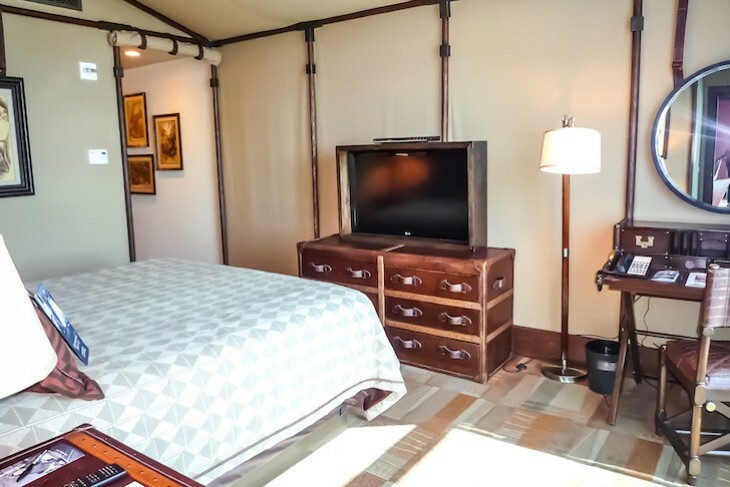 The suite’s guest room is reminiscent of a safari tent with camp desk, luggage-strapped bureau and side tables, canvas curtains and wall coverings, and rustic king bed. 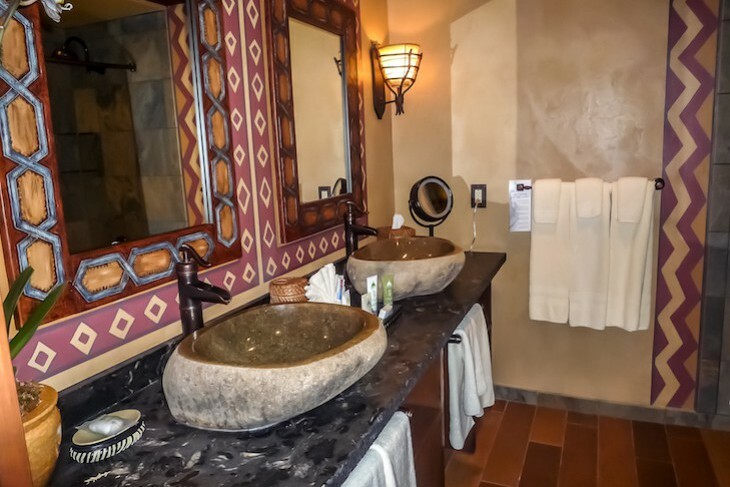 Yet another gorgeous bath features natural stone, above-counter basins, trough-like faucets, tribal mirrors, and a tub/shower with a separate commode area. The suite has lovely pool views but alas no balcony. 1,800 square feet sleeping five. 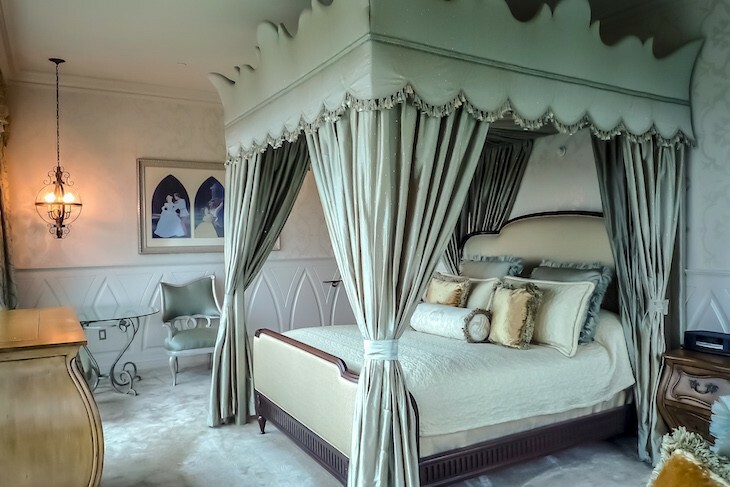 The Fairy Tale Suite is a princess’ dream come true. At only 725 square feet what it lacks in size it makes up in pure charm. Who greets you on arrival? None other than Tinker Bell with a sprinkling of pixie dust in the suite’s entry hall (just you wait and see!). Two steps down the bedroom adorned with silver and shimmery sage fabrics and carpeting holds a luxuriously draped and oh-so-romantic canopy bed as well as a silky chaise lounge, the perfect spot for resting royalty. 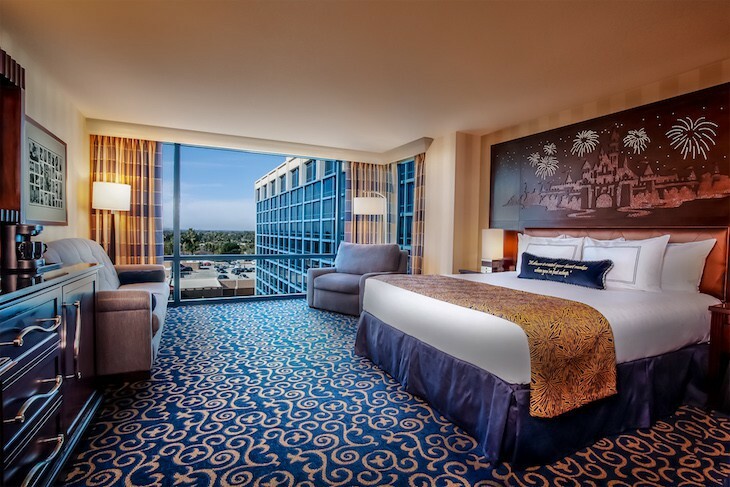 At the touch of a button a wall of curtains opens to reveal a magical view of the Disneyland Resort and the nighttime fireworks shows. Not even the TV will spoil your view since is can be raised and lowered within the bureau remotely. 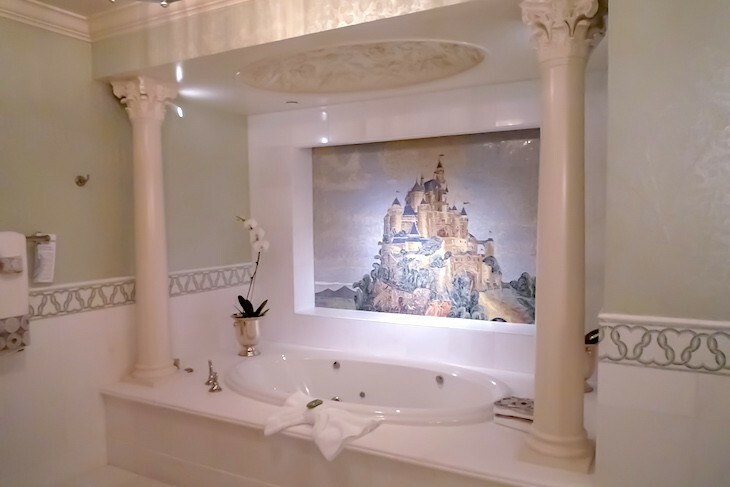 In the massive white marble bath a mosaic of Sleeping Beauty Castle is spread over a fantasy whirlpool tub flanked by Corinthian columns. Shooting stars twinkle above double sinks with a makeup vanity nestled in-between; mosaics adorn the marble flooring; a luxurious steam shower is encased in frosted glass; and a separate room houses the bidet and commode. To top it all off, the vanity mirror disguises a built-in, almost magical TV. This dreamy hideaway fittingly sleeps only two guests. The Old West is alive and kicking at the Big Thunder Suite. 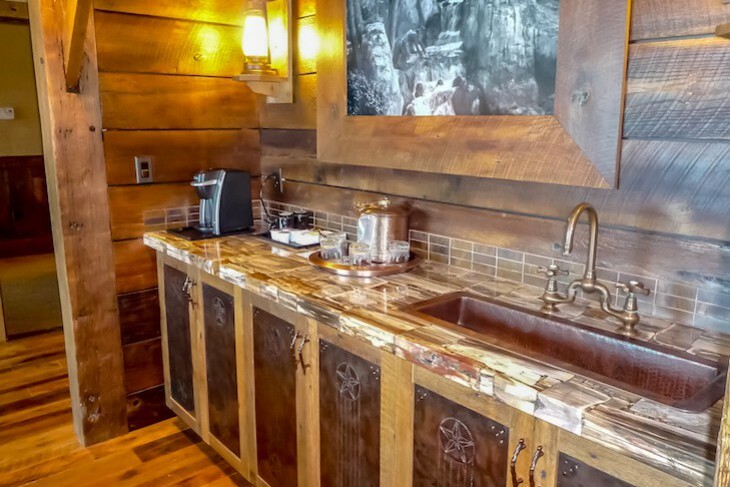 This two-bedroom beauty has a doorbell that rings like the howl of a wolf, a foyer with sounds effects from a runaway mine train, stone columns, repurposed barn wood flooring and paneling, and Navaho-style rugs. 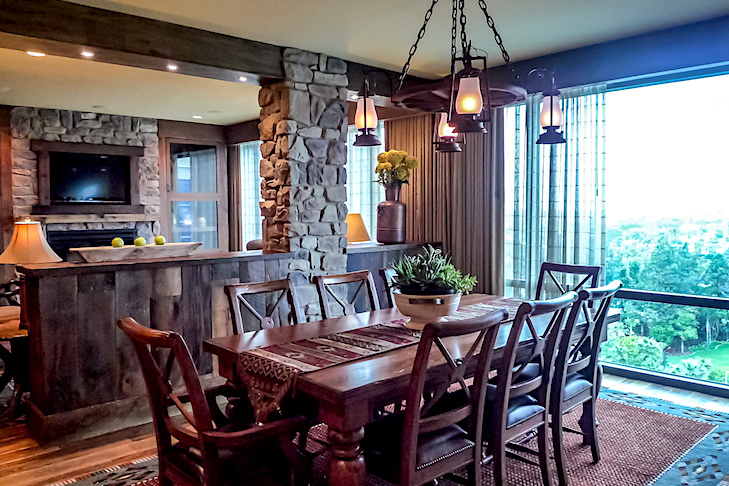 A mixture of rustic and luxury is on display in the suite’s living area with a stone gas fireplace centerpiece with hidden TV above. A cowhide covered armoire, leather sleeper sofa, and two oversized chairs mix with antique mining tool accessories. 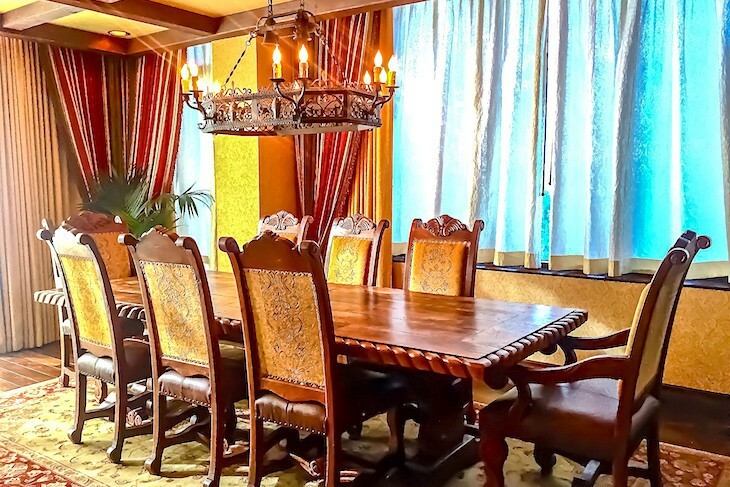 The eight-person dining table is lit by a wagon wheel chandelier, and a nearby wet bar has an unusual trough-style copper sink over which hangs a “magical” gold miner photo. A half bath is found off the living area with a copper bucket sink, lantern light fixtures, and pull-chain commode. There’s no balcony, but lovely views of the resort pools are seen from the oversized windows. The master bedroom has a king bed with a leather and wood headboard, Nubuck spread, leather pillows and bolsters, desk, leather easy chair, and entertainment center with TV. It is, however, the master bath that really stands out. 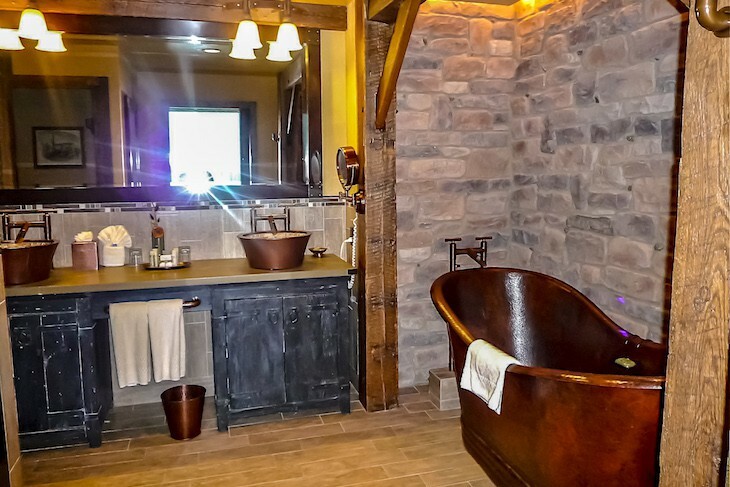 You enter through a sliding barn door to find a freestanding copper tub set in a stone surround alcove, pebble-lined steam shower, above-counter copper sinks, a magical TV concealed within the vanity mirror, and a separate commode area. On the other side of the living area is the second bedroom decorated 50s-style cowboy with a queen bed topped in a plaid spread, boot lamps, and single sink bath. 1,450 square feet sleeping six. 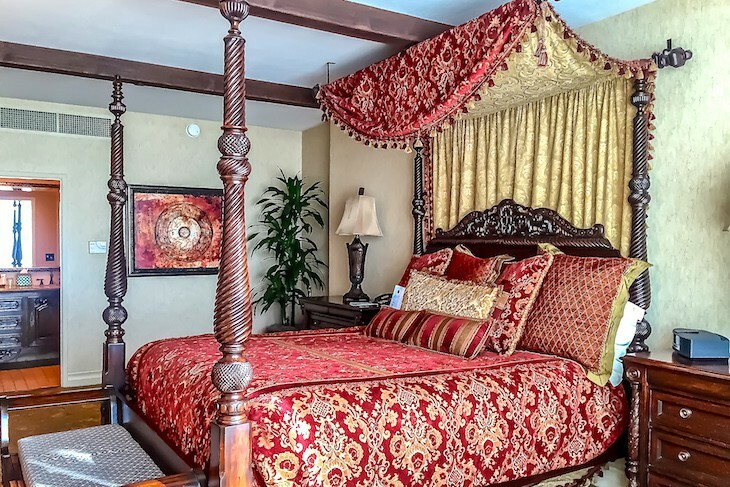 The whimsical two-bedroom Pirates of the Caribbean Suite’s. Don’t jump when the doorbell rings with “Yo Ho, Yo Ho, A Pirate’s Life For Me” – tough enough to get this ditty out of your head after a ride on the Disneyland Park attraction, even tougher when the kids are ringing it over and over again! 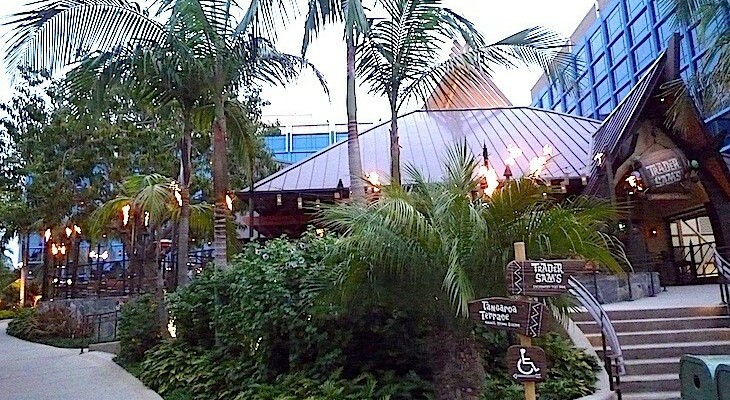 It features wooden beams and planked floors with Spanish colonial-style furniture, rich area rugs and heavy brocade drapery in deep red and gold tones, potted palms, leather sofa, two high-back occasional chairs, desk, a rustic dining room table for eight, and wet bar, all inspired by the Pirates of the Caribbean films and attraction. 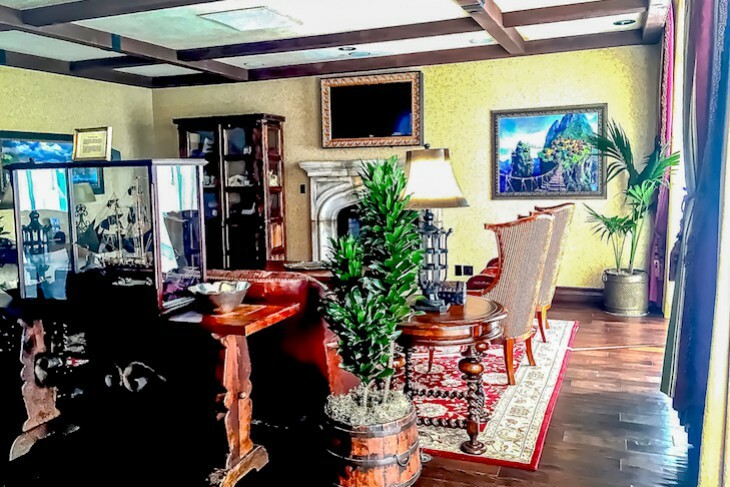 A faux fireplace flickers with realistic flames and above sits a Jolly Roger painting hiding the TV. Scattered throughout is a treasure trove of pirate memorabilia, including a replica of Davy Jones’s dead man’s chest, pirate maps and figurines, model pirate ships, even Jack Sparrow’s revolver. In a smallish master bedroom, a.k.a. Captain’s Quarters, a half-canopied bed is draped in royal red and gold brocade. 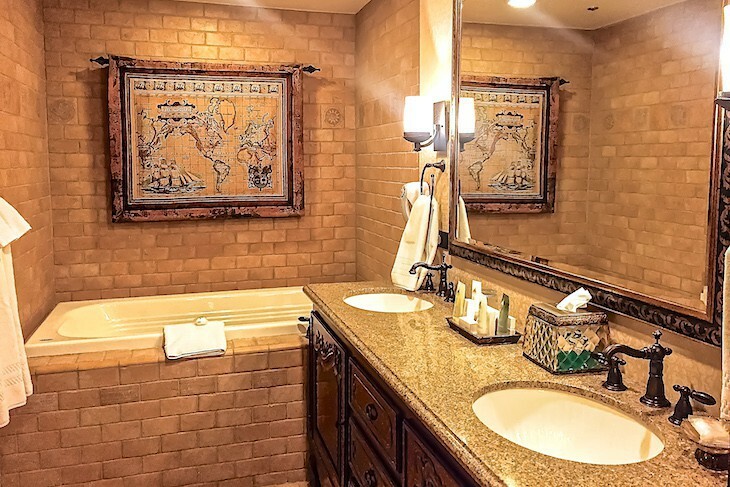 There’s also an entertainment center, easy chair and ottoman, and the master bath features ornate vanity mirrors, red brocade-like wallpaper, double sinks, whirlpool tub, and steam shower all in one area. For the mateys is the guest room with a pair of double beds, explorer map motif bed runners, and treasure chest entertainment center with a single-sink bath with a separate toilet/bathtub area. There is a 3rd bonus bath, and views from the suite are of the pool via stand-up French balcony. Sleeps four guests with 1,770 square feet. Talk about a big cheese, you won’t believe the Mickey Mouse Penthouse! 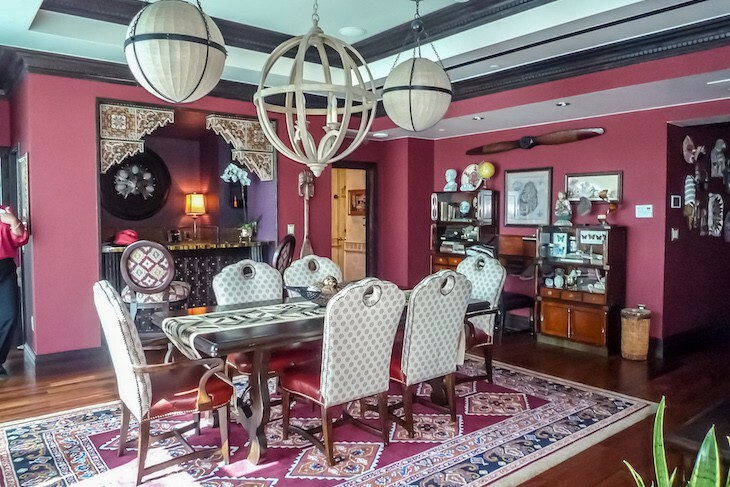 This suite, with 1,725 square feet, two bedrooms and two- and a half baths, is certainly a colorful affair. The modern look is not for everyone; its black, white, red, and yellow color scheme and Mickey Mouse memorabilia in every nook and cranny is different indeed. The oversized living room pops with hardwood floors covered with wacky area rugs, contemporary furnishings including an armless sofa and red leather easy chairs, and a wall of animator pencil drawings of the mouse himself. Overhead is glowing Mickey cutout lighting. If you are a media buff then you’ll adore an entire wall of TVs and a state-of-the-art stereo system. 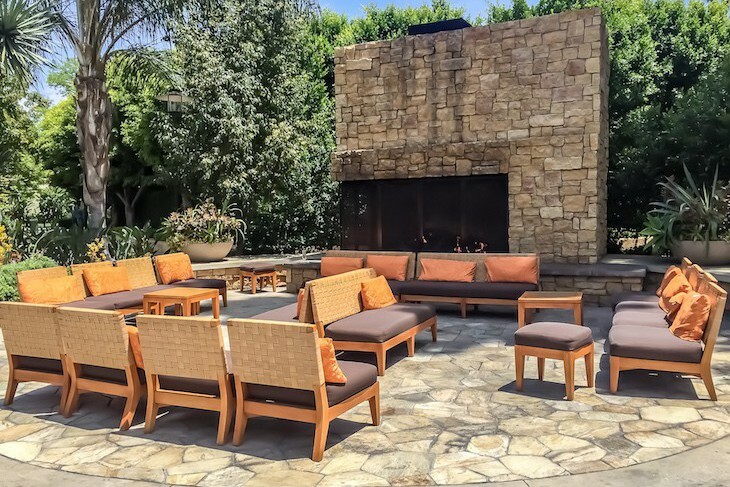 An adjoining dining room seats eight people and has the bonus of a wet bar with three stools. 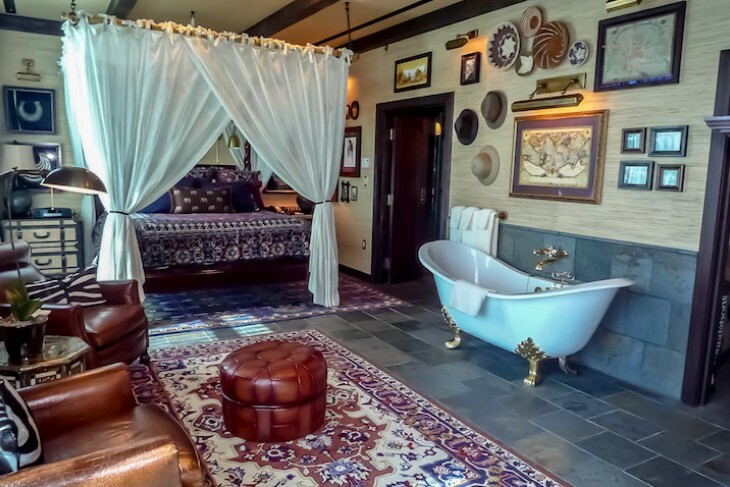 The master bedroom has a king bed with red leather headboard surrounded by Mickey maquettes (scale models) and a bath featuring a steam shower, whirlpool tub, and a double vanity with a magic TV in the mirror. And don’t be shocked when the shower heats up and an image of Mickey appears on the tiled wall! The second bedroom is fun, fun, fun with a round bed, Mickey Mouse motif armoire, puffy Mickey-hand pillows, TV and PlayStation, and even an animator’s station perfect for hours of playtime; the adjoining single sink bath is an accessible one. Views are of the Disneyland Resort and yes, you can see the fireworks from the suite. Regal Suites are non-themed, one-bedroom affairs that can connect to make either a 2 or a 3-bedroom suite. A nice-size living area with sleeper sofa and half bath connects to standard-type guest rooms with two queen beds. Many standard One-bedroom Suites are located on the 14th floor of the Frontier Tower and come with a balcony. In this Tower views vary of either the pool or the parking area and Disney California Adventure Park. Near the entry is a half-bath with black granite countertop and wet bar with sink, under-counter refrigerator, and three white leather barstools. In the parlor area is a sleeper sofa, easy chair, desk, and flat-screen TV as well as access to the Plexiglas-enclosed balcony. 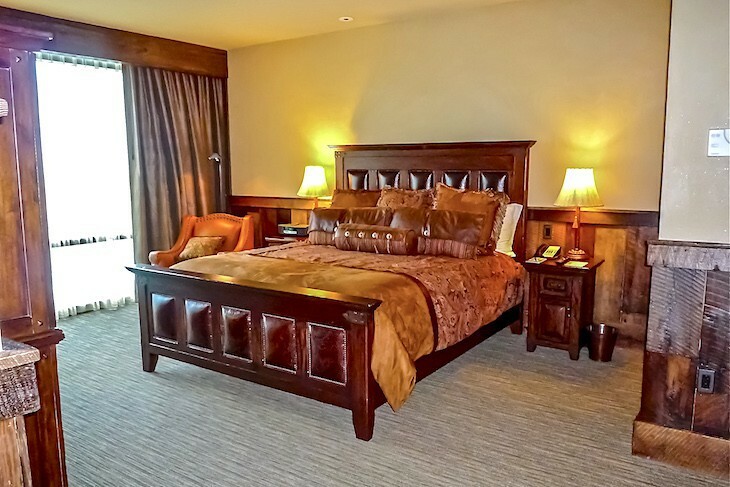 The suite’s master bedroom offers a king bed with lighted castle headboard, easy chair, and entertainment center, and in the bath are double sinks and a separate tub/shower and commode area. Ambassador Suites are located in the Frontier Tower and are corner units, each with 1,400 square feet. A long entry hall leads to the living/dining area with sleeper sofa, two easy chairs, desk, entertainment center with TV, and 6-person dining table. Off this area is a wet bar similar to that of the one-bedroom suite. Bedrooms are located behind the wet bar area down a long, strange hallway. The master has a king bed, easy chair, another balcony, and single sink bath with a separate tub/shower and commode area; the small guest room also has a king bed and bath. A half bath is in the hallway off the guest room.